Two prison guards who were held hostage have been released, police said. Five inmates were killed in the riot. Two were beheaded while two more died after being pushed off the prison roof. Police are probing how the fifth died. The prisoners had complained about the way Cascavel was run, its food and lack of hygiene. Other accounts say that there were three beheadings. The First Capital Command (Primeiro Comando da Capital – PCC) was inspired by the Red Command (Comando Vermelho). 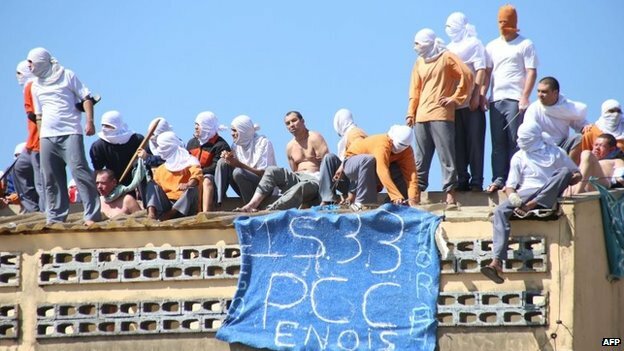 Both criminal organizations were formed by prisoners as self-protection groups in Brazil’s brutal prison system. The PCC arose in São Paulo in the 1990s, and has fought a bloody ongoing feud with police in the city. The group, now the largest and best-organized criminal organization in Brazil, is believed to have members in two-thirds of the country’s states, and controls drug trafficking routes between Brazil, Bolivia, and Paraguay. Security forces are still searching the Cascavel jail; O Globo reports that as of yesterday, seven inmates were missing.